Absurdist farce about Congressional aides whose zeal, stupidity, and occasional flashes of insight take on great significance in an out-of-control Beltway bureaucracy. Idealistic Lenny Keeler joins the staff of Pennsylvania Congressman Ezra Wheezle—but only after he’s enlivened Wheezle’s boring speech by jumping into a river to save a girl from drowning. Meanwhile, airhead Dickie Vanderholz, an inept academic who holds a Ph.D. in volcanos, becomes an irresistible political force when, as a useless researcher on a senatorial committee, he begins a crusade to make daylight savings time a permanent, year-round affair. Miriam Moskowitz, Vanderholz’s cynical supervisor, rival, and, finally, swooning lover, discovers that a passionately advocated single issue understood by no one, such as the equipment-that-does-not-work tax credit, can pitch a washed-up hack like Wheezle into the Oval Office. 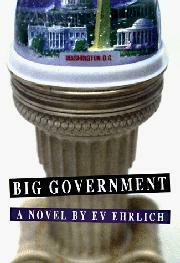 With a nod to the paranoid paradoxes of Heller’s classic Catch-22, first-novelist Ehrlich’s Capitol characters appear as the victims of a vast, incomprehensibly foolish anthill of craven ambition and blatant greed. The only winners here are people like handsome, vacuous President Wade F. Hoak, who, after realizing that “making history is interesting work, but, the fact is, we all can’t be Nixons,” happily quits after his third year in office, in exchange for a $50-million going-away present from his wealthy backers. Included among the denizens helped, or hurt, by Ehrlich’s trio of plucky slaves are tough-talking House Speaker Rollo Plank, a 114-year-old Idaho congressman, and TV preacher Colonel Cody Clark, a smarmy faith healer of spiritually delinquent bodies, souls, and stock portfolios. A beguiling satire of Washington’s wacky ways and means that, for all its dead-on delights, lacks bite. Funny—but featherweight.